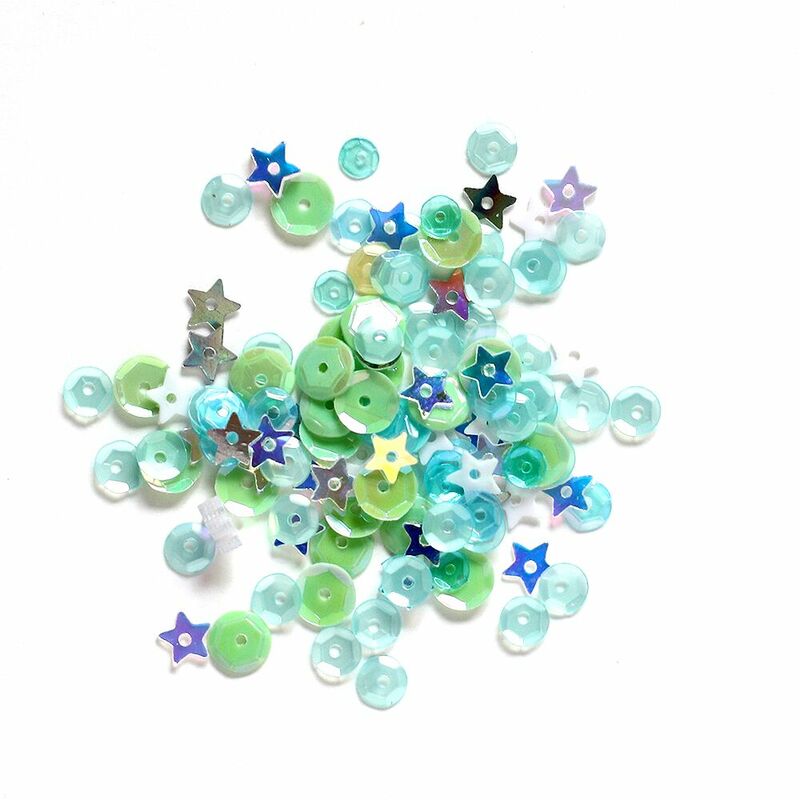 Hello, and Happy Wednesday crafters! I am very excited to be here with you today with inspiration using the latest Simon Says Stamp collection, Good Vibes! There are tons of beautiful, new stamps, dies, stencils and more in this release, which I hope you love! I designed two of the new products in this release, including the Classic Bicycle die and the Good Vibes word die set. I also arranged and built the Debra die, which is an adaption of our previously released, Debra stencil. Many of you asked to have this turned into a die, and we are excited to share that with you in this Good Vibes collection! 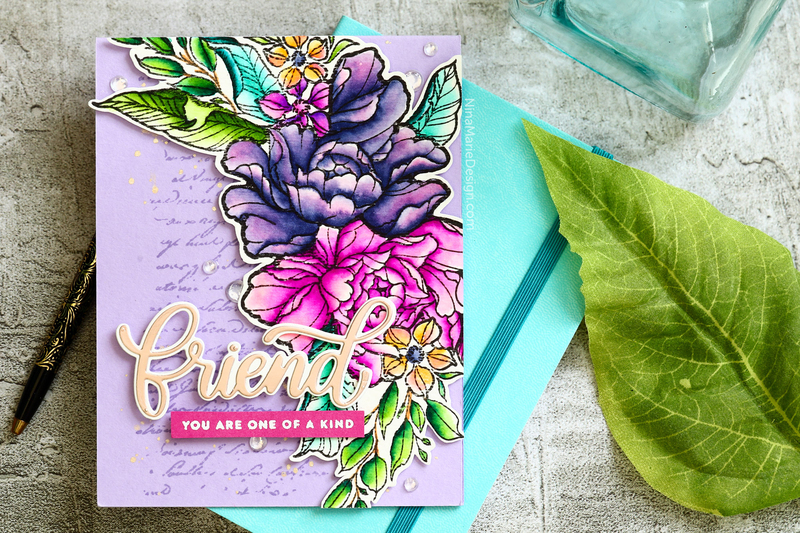 I’ll be sharing some card ideas using each of these products tomorrow for the 2-day release blog hop, so be sure to stop back. 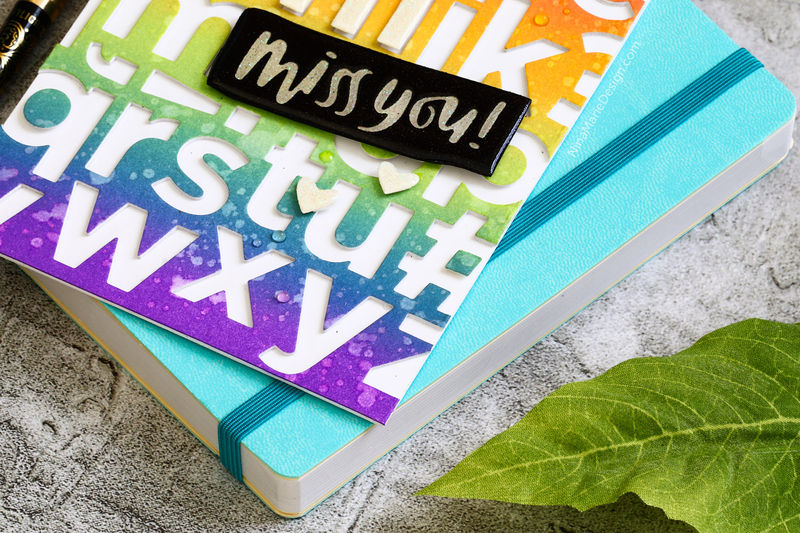 In the video above, I’ll be showing you how I made this colorful missing you card, which features the new CZ Design, Everett Solid alphabet letter dies, as well as the cute, Miss You Block word die. I ink blended a background with Distress Oxide inks, and cut the background with the alphabet dies. There are some Sugar Crystal and Black Sapphire glitter paper accents on the card, cut with the “h” and “i” Everett letter and Miss You Block dies. And you’ll also notice a few little hearts, which I cut with a few random heart dies. Over each of those die cut elements, I added a thick layer of Glossy Accents; the dimension looks so awesome! I also used the Strangeness stamp and die set, which was also just released in the Good Vibes collection! I stamped the flower cluster with Ink on 3 Blackout ink and colored in the florals with Zig markers. 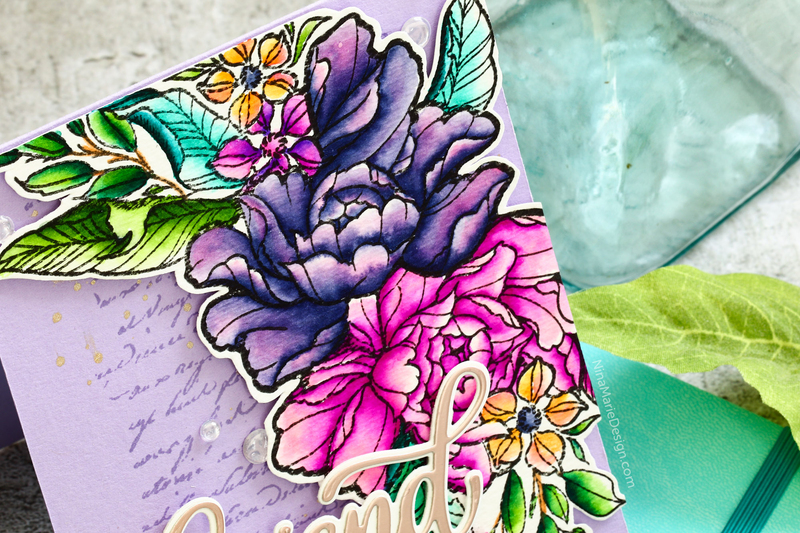 After coloring the flowers, I mounted the image onto a Lavender card base; the card has the 49 & Market 1787 script background stamped onto it using Ink on 3 Juicy embossing ink, which creates a nice watermark effect. There are Finetec gold watercolor splatters on the card base as well, which add some pretty shimmer! Finally, I added a die cut sentiment onto the card with the new Big Friend script word die set, plus a secondary greeting that I white heat embossed from the Kind Flowers stamp set. I hope you enjoyed today’s inspiration! 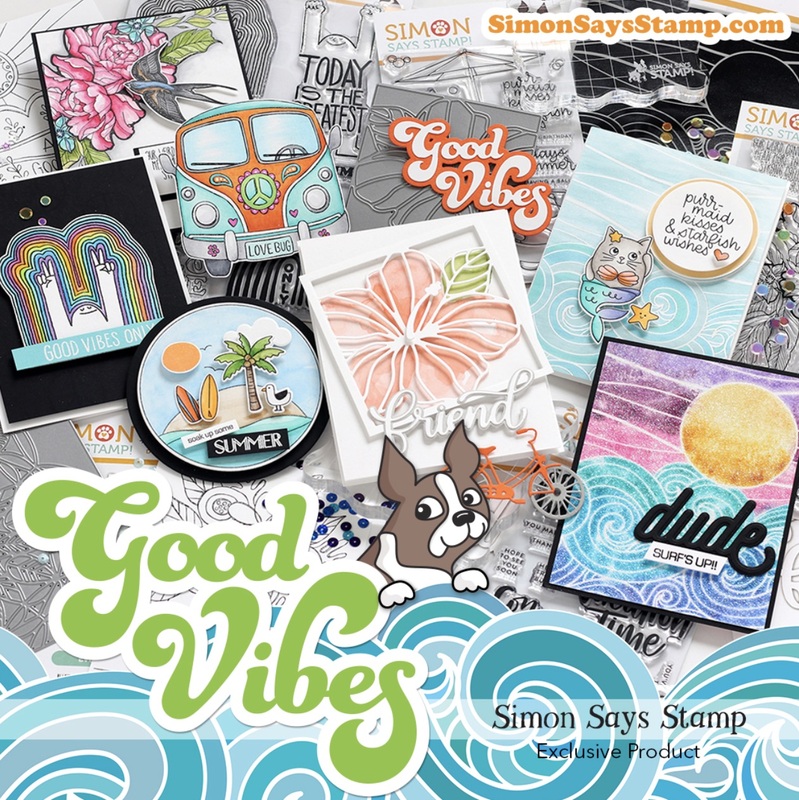 Be sure to check out the Simon Says Stamp Good Vibes gallery, to get even more ideas using these fun, new products! Thanks so much for stopping by today; I will look forward to seeing you tomorrow for the release blog hop! Nina, both cards are beautiful, but the one with the Strangeness Stamp has to be one of your most gorgeous cards! Simply incredible! I like both cards but i really love what you did with the Strangness stamp! Beautiful!! Wonderful cards and I have to say I LOVE the Strangeness Stamp, so gorgeous! Both the cards are Amazing! !